Breathtaking views & easy access at 4,000ft. 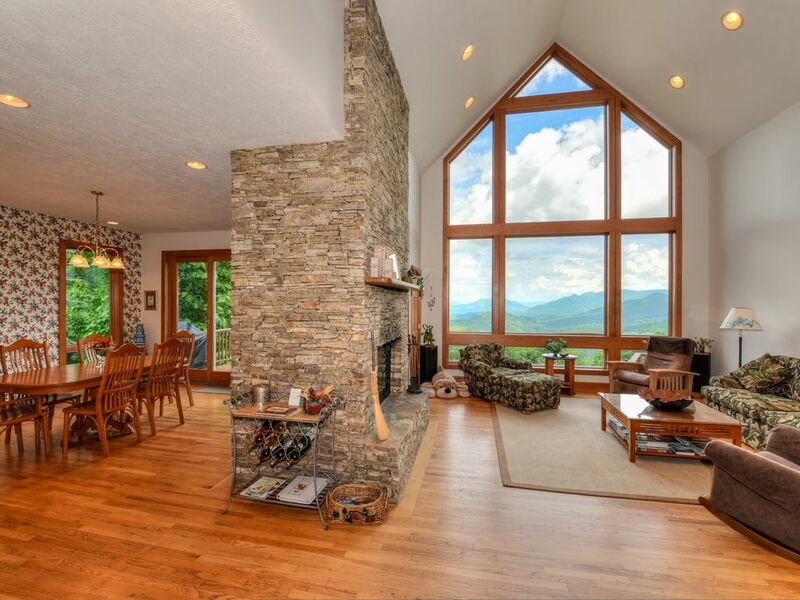 This spectacular, 3,000 square foot, custom-built home with breathtaking views of the Smoky Mountains, is 30 miles southwest of Asheville, North Carolina at an elevation of 4000 feet, in a secluded but easily accessible area with nearby streams and hiking trails. You will enjoy fabulous mountain views from every room, as well as when you are relaxing in the spacious hot tub, barbecuing and dining on the deck or sipping a cold drink while watching the colorful hummingbirds and songbirds. You will be located only minutes away from many popular attractions such as the palatial Biltmore House and Gardens, Maggie Valley, Cherokee Indian Reservation & Casino, Blue Ridge Parkway, numerous championship golf courses, horseback riding, exciting white water rafting, llama trekking, snow skiing on Cataloochee Mountain, Great Smoky Mountain National Park and Railroad, gem mining and delightful craft and antique shopping and dining in Asheville, Waynesville and Dillsboro. Both the gourmet and novice cook will appreciate the inviting kitchen with abundant wood cabinets, beautiful granite counters, convection oven, side by side refrigerator, gas stove, microwave, cookbooks and spice collection. Besides relaxing in the large, comfortable living room with a 100+ channel HD TV w/premium channels, wood burning fireplace, VCR and CD player, you may retreat to the loft to enjoy a good book from our lending library or write a letter or send a fax from the office. For folks that are Internet junkies, there is even high speed Internet access via cable modem for your laptop computer. If you are especially fortunate to reside in the master suite, you will love the stone fireplace, flat-screen TV, panoramic mountain scenery, walk-in closet and easy access to the deck and hot tub adjoining the bedroom. The huge master bathroom boasts heated marble flooring, a large Jacuzzi bath, two sinks, separate shower and vanity area. Linens, drapes and wallpapers throughout the home are coordinated in the latest Laura Ashley and Waverly designer prints. ACCESSIBILITY: Even though the house is three levels, you drive up to the house on the main level and there are no steps, you simply get out of your car, which is on a cement drive with a covered carport and walk into the house. The main level has the living area, kitchen, master bedroom and access to all the decking. DEPOSITS & PAYMENTS: A $500 deposit and the full rental fee is due upon booking and there are no refunds. The renter is encouraged to purchase travel insurance to mitigate any risk to the renter. We purchased the land in the mid 70's and decided to build in 1998 and use it for vacationing and possible retirement. It was a labor of love and now we are enjoying it as much as we can. We have several good friends who come to the area regularly and some who live here full time now. It's easy to say, but not so easy to find; great view and easy access. Only 1.5 miles off the main road and paved all the way. You drive into a covered area and in three pases you ate standing at the door. Most people marvel at the quality of construction and attention to detail. Please visit the owner's website for lot's more information and photos. Outdoor hot tub, indoor Jacuzzi, outdoor gas BBQ. Primary Renter Minimum age of 30. This property ranks at the top in every way possible. It is very modern in design, with a sweeping view of the valley below from the entire upper floor. It has a fully stocked kitchen, gas fireplaces, and hot tub. It has paved access, with a circle driveway and carport to protect your vehicle from the weather. Jacuzzi tub and shower with HEATED floor tiles in the Master Bath. The property has an alarm system that the renter can activate for added security. It has bedrooms on two levels that allow for added privacy. Communication with the owner was exceptional, We had all the information we needed well in advance. There are instructions to the renter in the home that fully explain everything you need to know upon arrival, and what to do upon departure. Unlike most rentals in the area, you do NOT have to haul the garbage off if you choose not to. The price per value of this rental is also exceptional. We would defiantly stay here again! The property is in good condition and clean. Beautiful views and centrally located. As advertised and more ! The location is easy to access and has incredible long range mountain views. The house is extremely clean, comfortable and well taken care of. I didn't come planning to cook (on vacation) however if I did, the kitchen is well stocked and ready. We were trilled with the deck, relaxing in the hot tub while enjoying the view. I was early to rise just to have my morning coffee outside. Unfortunately we had rainy evenings (out of John's control) and wasn't able to sit outside as much as we would have liked to. Maybe some type of roll out awning over a portion of the deck for those rainy days would be a nice addition. John has thought of everything to make our stay perfect and I look forward to our next visit, for a much longer period. This is a perfect home for vacation! Amazing view from every room, beautiful deck to relax on and enjoy nature and the scenery, lovely landscaping, clean and well kept, all amenities you could possibly need, and then some! It's also close enough to local shops and restaurants but private enough to enjoy the peace and quiet. I'd highly recommend it to anyone and would look forward to staying there again. We enjoyed our one week stay in this incredibly spacious home with exceptional views from each room of the house. If you’re looking for a well kept hidden gem in the mountains, let me just say, look no further. Everything from the quiet surroundings, to the well maintained property and prompt response from the owner, we couldn’t ask for anything more. Easy access to main highway, Apple orchard right across the highway. Lots of shopping to be done off Main Street. All while being able to enjoy a wonderful stay at Hummingbird Heights, wherein you are visited by actual hummingbirds during the day. Breathtaking sunrises to enjoy over coffee. Thanks again, for allowing us to stay in your home. We look forward to visiting again. PAYMENTS: The full amount of the rental, plus the security/damage deposit is due upon booking. The renter is encouraged to purchase travel insurance to mitigate any unforeseen circumstances that may cause a cancellation. CLEANING POLICY: Our cleaning fee is based on the actual charge from the cleaning service. This is done to encourage renters to leave the house as clean as possible and to have the charge reflect the actual work required. The minimum cleaning fee of $100 is for only two guests, when the downstairs bedrooms and bath are not used. If the downstairs is used, there will always be an additional charge over the $100 minimum; typically it is an additional $50-$100. Any additional charge not paid up-front will be deducted from the deposit refund. OUTDOOR SPA: The outdoor spa is not operational from December through April, due to potential extreme weather conditions and the possibility of freezing. We learned that lesson the hard way, to the tune of over $3,000! The owner's rental agreement will override any other written or implied terms.